We are pleased to release the latest version of PowerArchiver 2019 – 19.00.32/33. ZIP engine updates – Major updates to the ZIP engine. We have added several variations of both the encoder and decoder to speed up compression of files in fast and super fast levels, as well as optimized speed when 1 thread is used during encoding/decoding as well as a special decoder for highly compressed files. Added support for decoding files compressed with packmp3 in zipx. Overall a major update to the ZIP/ZIPX engine that will be explored in a separate article. Removed ACE library – late last week vulnerability was discovered in old ACE library used in 32bit versions of PowerArchiver. Within 24 hours of report of the issue in another compression software, we have issued updates to all latest variations of PowerArchiver with removed library. High dpi per monitor support – added support for configurations where user uses several monitors with different dpi settings. Onedrive and other cloud engines updated – fixed access issue with Onedrive and updated engines for all clouds supported. PowerArchiver 2019 is the smartest release of PowerArchiver ever. New Modern Windows 10 interface uses simplified ribbon to look great, with 3 all new skins – don’t like Windows 10? There are still Classic and Windows Ribbon interfaces. SmartAI will optimize your compression, save your power, change to dark mode, enable FIPS mode system wide, enable you to work conveniently with touch screens. We made PowerArchiver ZIP compression faster. 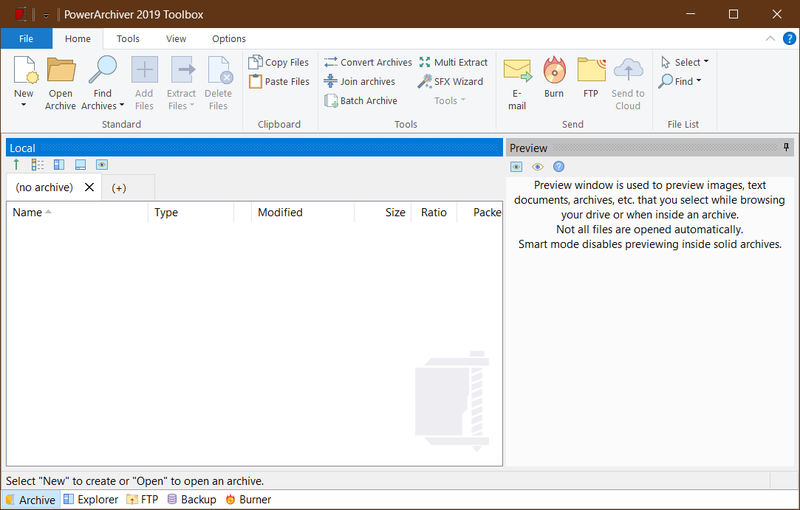 PowerArchiver Mini is back and lets you use full power of PowerArchiver within the Windows Explorer Preview window. The Advanced Codec Pack – .pa format has been fine tuned for the best compression and speed on the market! For a list of additional changes in the new PowerArchiver 2019, please check out PowerArchiver 2019 Introduction. PowerArchiver 2019 , with the Advanced Codec Pack (.PA), is now available from our download page as well as Patchbeam for PowerArchiver 2019 users. Thank you for your support since 1998! Previous Post PowerArchiver 2019 Preview - build 30 is out today! Next Post PowerArchiver 2019 Preview - build 44 is out today!